Electronic Kit School. - There are many electronic circuit that designed to result the best light with powered by panel solar now. One circuit that can produce portable solar lantern using 3V6/1W white LED is shown look like in Figure 1 below. With the main or major component used are solar panel, 3v6/1W white LED, Battery re-charger and other component complemented. This circuit is very simply because only need few component as needed. And now you can build this circuit in real condition easily. Circuit like in Figure 1 above show you about the 3V6/1W White LED Portable Solar Lantern Circuit. 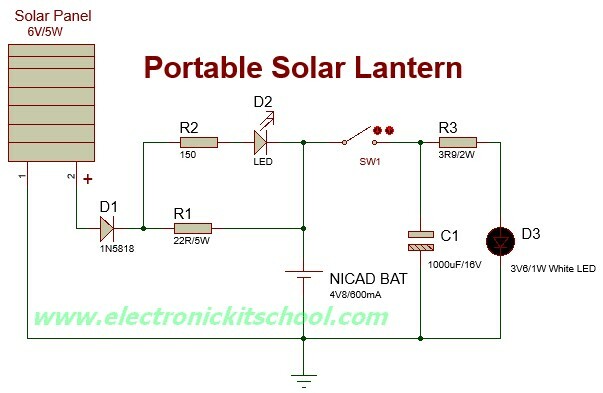 From Electroschematics site describe that this portable solar lantern circuit uses 6 volt/5 watt solar panels are now widely available. With the help of such a photo-voltaic panel we can construct an economical, simple but efficient and truly portable solar lantern unit. Next important component required is a high power (1watt) white LED module.